I recently acquired this beauty from a co-worker. The NCR System 3125, basically a VERY early PDA. It is a pen-based computer 386sl/20Mhz with 4M RAM. 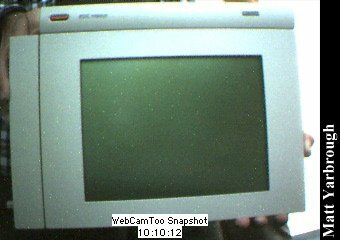 Passive LCD screen 640x480 VGA black and white (well, black and green). It has a port replicator for serial, parallel, mouse, and keyboard and monitor, as well as a type II PCMCIA slot. It works and everything! Runs Windows 3.1. Click here to view all comments for the NCR System 3125 and to leave your own. Click here to view comments about other NCR computers.